Designed for heavy incontinence, these unique briefs feature plastic-free sides and higher leg cut-outs for a cool and comfortable fit. Hook-and-loop fastening assures easy putting-on and adjusting. The cloth-like backing offers added dignity while the anatomically-contoured mat provides maximum absorbency, dryness and odor control. Size Small is a Special Order item. Special Order items may take 2-3 weeks to deliver and the order cannot be cancelled once placed or the item returned once received unless defective. Small fits waist sizes 20"-31"
Medium fits waist sizes 32"-44"
Large fits waist sizes 45"-58"
X-Large fits waist sizes 59"-64"
My mother is confined to a wheelchair all day & has dementia. She is either in bed or in a chair. Pros:Keeps down odors & no issue with rashes after use for 7 months. 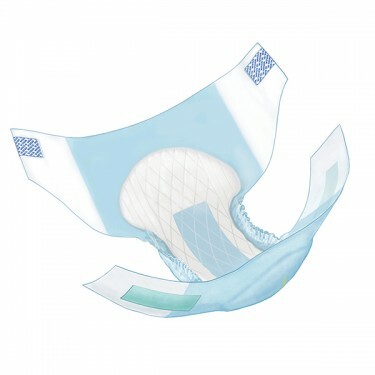 These briefs do not hold urine even with frequent changes when the patient is in bed on his back. Without elastic around the legs, these briefs do not fit well. Even with frequent changes, they leak out the sides. Pros:The loop closures work well. There is little to no leakage when the patient is sitting up. Cons:No elastic to fit closely around the legs. Leakage even when patient is in bed and on back. My husband is bed ridden and these diapers work very well.